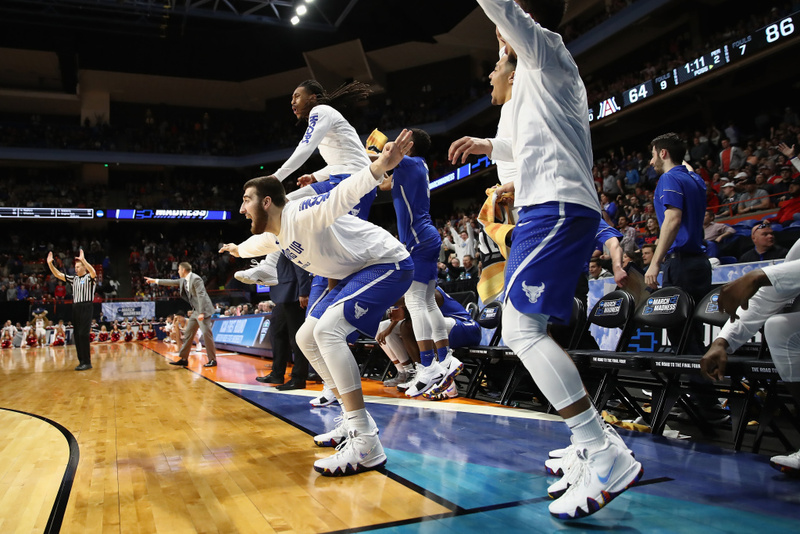 The Buffalo Bulls bench reacts in the second half against the Arizona Wildcats during the first round of the 2018 NCAA Men's Basketball Tournament at Taco Bell Arena on March 15, 2018 in Boise, Idaho. Amid an FBI corruption investigation, a Pac-12 task force has put forth a sweeping set of college basketball recommendations. As reported by the Los Angeles Times, the 50-page proposal includes and end to the one-and-done rule, which was implemented by the NBA in 2005. The rule prohibits players from joining the league until the age of 19, or requires them to wait until one year after their high school graduation. Under the new guidelines, athletes would keep the option to attend college but would not be eligible for another draft until after their third season on campus. This would push the NBA to accept players out of high school, and for those who do choose to attend college, postpone recruitment to enable athletes to invest in school and take classes more seriously. Last month, Yahoo! Sports reported on a number of NCAA players who allegedly took money from a defunct sports agency and more than 20 of the top basketball programs in the country in violation of NCAA rules. The NBA and its players haven’t typically been on-board to change the one-and-done rule, but the recent scandals may change that. We get the latest from two reporters following the story.